Their decision comes as the French prosecutors identified the second man involved in the killing of a priest in Normandy. A wreath of flowers next to the church where an hostage taking left a priest dead. SEVERAL MAJOR MEDIA outlets in France have said they will no longer use photographs of killers responsible for terror attacks to avoid giving them “posthumous glorification”. 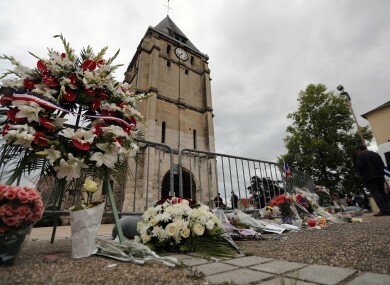 Their decision comes as the French prosecutors identified the second man involved in the killing of a priest in Normandy, naming him as 19-year-old Adel Kermiche. The country’s two global news broadcasters RFI and France 24, as well as its biggest rolling television news channel BFMTV, said they would stop showing images of the attackers. The public Arab-language radio station Monte Carlo Doualiya followed suit. Daily newspapers Le Monde and La Croix had earlier announced similar moves, while Europe 1 radio station went further still saying it would not be “naming terrorists”. “We realised after the Nice attack that we were very uncomfortable about a series of photos from the attacker’s past,” Le Monde’s managing editor Jerome Fenoglio told AFP, referring to widely circulated images of Mohamed Lahouaiej Bouhlel flexing his muscles and salsa dancing. “It is not about hiding the facts, or where these killers came from, which is why we do not agree with not naming them,” Fenoglio added. BFMTV, which came in for criticism for interviewing gunman Amedy Coulibaly during the January 2015 kosher supermarket hostage siege in Paris in which four people died, said it had also stopped using images of attackers. “We made the decision last night to no longer show pictures of the terrorists until further notice,” said editorial director Herve Beroud. He said the station would continue to name attackers. “The difficulty of this debate is that we have to guard against not informing people,” he added. But the left-leaning daily Liberation said it would continue to name and publish photos of attackers. “Publishing photos of terrorists and glorifying them is not the same thing,” deputy managing editor Johan Hufnagel said. The surprise decisions came as Europe reeled from a wave of violence as a German expert told AFP that there was strong preliminary evidence that blanket media coverage led to further terror attacks. Professor Michael Jetter warned it could also be a factor in inspiring other unbalanced people to kill. “If you devote a lot of coverage to an attack, we will see more attacks in the following week and more also in the coming months,” said the researcher at the University of Western Australia, who has studying data on terrorist violence dating back to 1970. “If you think about it for a second from the perspective of a terrorist organisation, (blanket coverage) is exactly what they want,” he said. The brutal killing of the elderly priest on Tuesday has further traumatised a country already reeling from the truck massacre in Nice in which 84 died — the third major terror attack in 18 months. Jetter said Europe now seems to be experiencing “co-related phenomena” of school-type mass killings and self-radicalised jihadist atrocities. “There are two elements mixing together at the moment. The terrorist organisations want the media platform and as much coverage as possible. “And with school-type shootings — if you give an individual that level of coverage that by itself may encourage other shooters,” he warned. However, the agency will leave it up to its 5,000 clients worldwide to decide whether to publish the attacker’s name and photograph, she said. Email “French media say they'll no longer use terrorists' photos to avoid 'glorification'”. Feedback on “French media say they'll no longer use terrorists' photos to avoid 'glorification'”.